Special occasion deserves a special recipe - and here it is! Beautiful on every table when dining or having party. 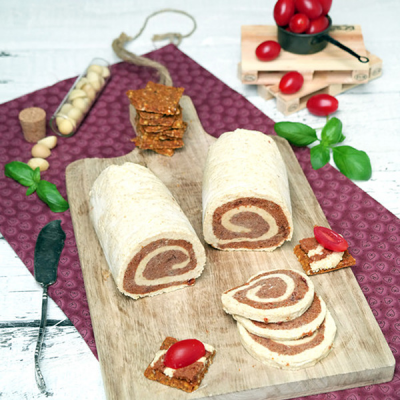 The combination of macadamia nuts and dried tomatoes is full of surprises! Give it a try! Soak sundried tomatoes and macadamia nuts in cold water for at least 8 hours (in two separate bowls), then rinse well and drain. Toss nuts, linseeds, coconut oil, lime juice, garlic, salt and pepper into your blender (or food processor) and blend until smooth. You might need to add some water to help the process. Since we used a high speed blender and not a food processor, we had to add some water and use its tamper, as the mixture was rather sticky. Don’t clean the blender too thoroughly (i.e. leave a small amount of sticky macadamia mixture inside). Stretch/spread the mixture onto a prepared 10x20 baking tin and level off evenly. Let it rest in the freezer for about 1 hour (so that you won’t make a mess when you spread the tomato paste onto it). Toss sundried tomatoes, oregano and possibly salt into the “dirty” blender and blend until smooth (adding some water if need be). Take the cheese layer out of the freezer and spread the sundried-tomato paste onto it, leaving 1—2 cm at each end and at the sides. ; level off evenly and wait 10 minutes to let the cheese base soften. Roll it up to enclose and seal well the sides. Let it sit in the fridge overnight before serving. Super yummy on our Life crackers.